Partnering with Pilipinas Taj Autogroup, Inc., Tata Motors, India’s largest commercial vehicle manufacturer and among the top ten globally, launched a range of commercial vehicles in Philippines. In the image (Left to Right), Mr. Rajesh Khanna (Head Product Management, Commercial Vehicles Business Unit, International Business, Tata Motors), Mr. Rustom Nagporewalla (Regional Head – ASEAN & Far East Commercial Vehicle Business Unit, Tata Motors), Mr. David Coyukiat (Chairman of the Board, Pilipinas Taj Autogroup, Inc.), Mr. Rudrarup Maitra (Head-International Business, Commercial Vehicle Business Unit, Tata Motors), Mr. George Blaylock (Managing Director, Pilipinas Taj Autogroup, Inc.), Mr. Ferdi L. Raquelsantos (Board of Director, Pilipinas Taj Autogroup, Inc.), Mr. Cresencio Fernandez, Jr. (President, Pilipinas Taj Autogroup, Inc.) and Mr. Arthur Balmaldrid (Vice-President, Pilipinas Taj Autogroup, Inc.). 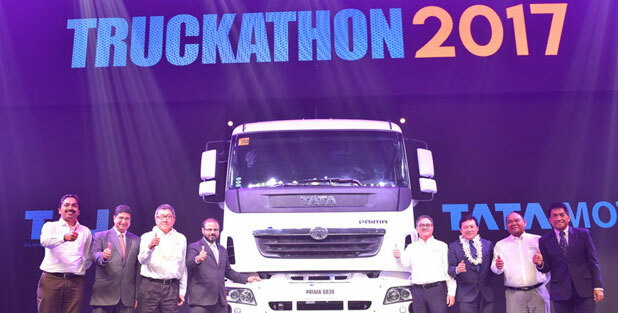 Tata Motors, India’s largest commercial vehicle manufacturer and among the top ten globally, launched a range of commercial vehicles in Philippines. The company is making headway in the Philippines market through a distribution agreement with local partners Pilipinas Taj Autogroup, Inc., an important business conglomerate engaged in the local distribution of motor vehicles. Through this partnership, Tata Motors will commence the supply of its commercial vehicle brands – the Tata Prima Range of Tractor Trailers and Tippers, the LPT range of Light, Medium and Heavy Trucks, SFC 407, and the Mini Trucks range of Ace and Super Ace. Besides Philippines, Tata Motors commercial vehicles are present across several South-East Asian markets including Malaysia, Vietnam, Indonesia, and Thailand with manufacturing facilities in Vietnam, Thailand and Malaysia. Commenting on the occasion, Mr. Rudrarup Maitra, Head (International Business), Commercial Vehicles, Tata Motors said, "Philippines is one of our key markets in South-East Asia and we are delighted to be a part of one of the fastest growing ASEAN nations. With years of experience in the commercial vehicle business, we at Tata Motors have analyzed and understood our customers well and are dedicated to providing them with best-in-class products and services. We are confident that through our trusted partnership with Pilipinas Taj Autogroup, Inc., we will be successful in establishing a long-term relationship with our customers." Mr. Jon Fernandez, Jr., President of Pilipinas Taj Autogroup, Inc., said, "We, at Pilipinas Taj Autogroup, Inc., are proud to partner with Tata Motors to offer customers with sturdy and reliable vehicles. We are looking forward to this new opportunity and are committed to catering to the commercial vehicle market with India’s largest and most trusted automobile brand here in the Philippines. We will closely work with Tata Motors to ensure customers here get the finest vehicles and services, that not only match their requirements but also their business needs." Tata Motors Limited, a USD 42 billion organization, is a leading global automobile manufacturer of cars, utility vehicles, buses, trucks, and defense vehicles. As India’s largest automobile company and part of the USD 100 billion Tata group, Tata Motors has operations in the UK, South Korea, Thailand, South Africa, and Indonesia through a strong global network of 76 subsidiary and associate companies, including Jaguar & Land Rover in the UK and Tata Daewoo in South Korea. In India, Tata Motors has an industrial joint venture with Fiat. Engaged in engineering and automotive solutions, with a focus on future-readiness and a pipeline of tech-enabled products, Tata Motors is India’s market leader in commercial vehicles and among the top in passenger vehicles with 9 million vehicles on Indian roads. The company’s innovation efforts are focused on developing auto technologies that are sustainable as well as suited. With design and R&D centers located in India, the UK, Italy, and Korea, Tata Motors strives to pioneer new products that fire the imagination of GenNext customers. Abroad, Tata Motors cars, buses, and trucks are being marketed in Europe, Africa, the Middle East, South Asia, South East Asia, South America, Australia, CIS, and Russia. Established in the year 2012, Pilipinas Taj Autogroup, Inc., is an automotive distributor composed of individuals from a diverse range of industries, with known expertise in the area of insurance, automotive and its allied industries, consumer retail and service, and finance. Armed with a collective knowledge and understanding of the Filipino consumer to confidently build the local business through brand building, marketing, promotions, dealer network development, financing, and customer service and satisfaction.